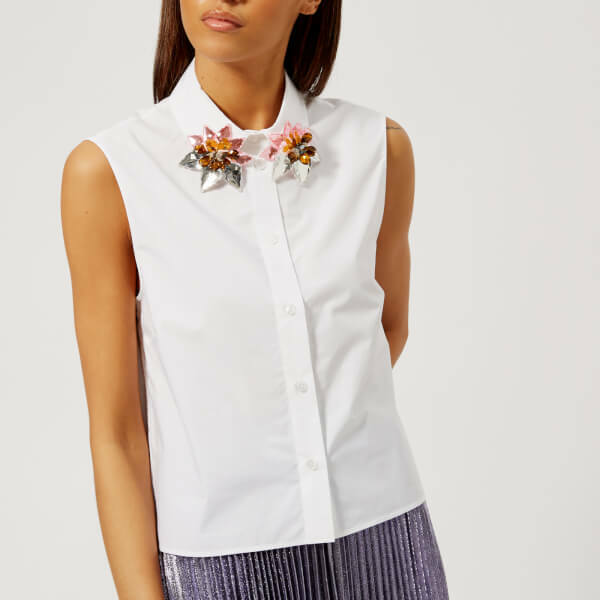 From twirling, whirling lame pleated skirts to crisp white sleeveless shirts with the most bejewelled embellishment on the collar to make a hot sunny day more glamorous to comfy sweatshirts with Minnie Mouse looking fabulous with a Scottish twist, for those days when you want to just be you. This season the Coggles edit of Christopher Kane’s range are individual pieces which are pure delight especially the sunglasses and handbags. A fabulous ice pink velvet dress from British fashion label, Christopher Kane. Crafted from stretch velvet fabric, the pink midi dress is cut for an asymmetric silhouette with an off the shoulder design. The dress is detailed with short capped sleeves with rolled cuffs and a centre back split to the hem. Fastened with a concealed zip closure to the reverse. A fabulous pleated midi-skirt from industry-defining luxury fashion label, Christopher Kane. 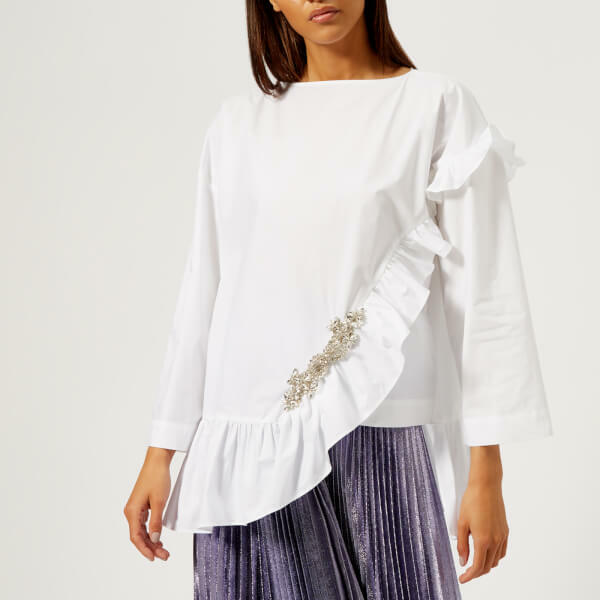 Falling to the mid-calf, the skirt is crafted from a silk blend lame with a silvery metallic sheen. 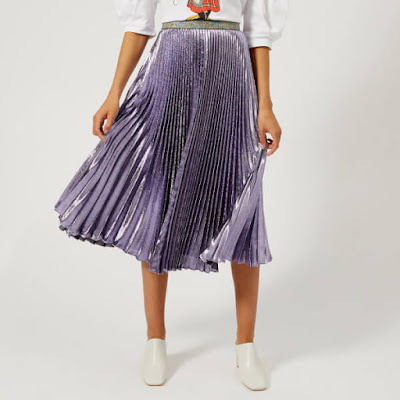 Boasting an A-line silhouette, the shimmery skirt features a concealed zip fastening along the side seam and contrast elasticated waistband laced with multi-coloured metallized fibres. Partially-lined with a black skirt slip. A pink mini cross body bag from industry-defining luxury fashion label, Christopher Kane’s Space Collection. 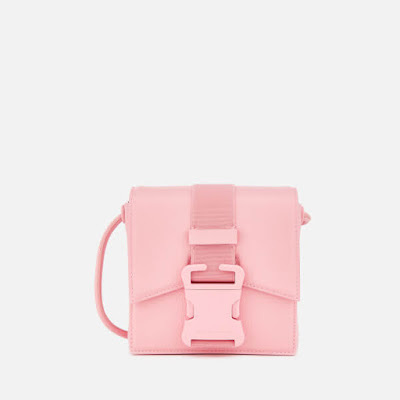 Crafted from soft, pebbled leather, the ‘Bonnie’ bag features the brand’s signature safety buckle fastening that secures the top fold-over flap. Within, the fabric-lined interior houses a single card slot and two slip compartments for smaller items. The bag is carried by a long rolled strap that can be worn on the shoulder or across the body. Detailed with tonal hardware and stitching. Finished with branding embossed to the front buckle closure. Butterfly shaped sunglasses from British designer, Christopher Kane. The quirky yet striking design is formed with a slim, gold-tone frame in a butterfly silhouette with a curved bridge. The lightly mirrored lenses comprise a bluish brown tint and adjustable silicone nose pads offer comfort. 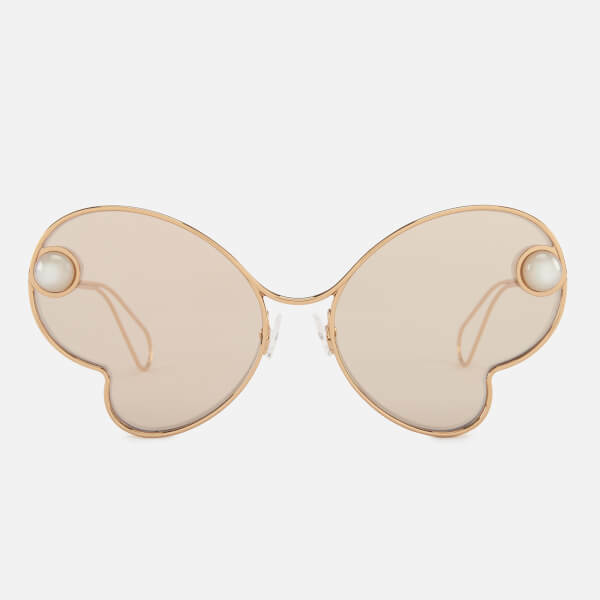 Slim metal arms with curved tips are attached to faux-pearl rivets on the lens. Finished with engraved branding on the temple arms and supplied with a branded leather case. An embellished T-shirt from Christopher Kane. Cut from premium cotton, the black tee has been designed with a classic ribbed crew neck and accentuated with an arrangement of crystals at the collar. Finished with short sleeves and a straight hem. 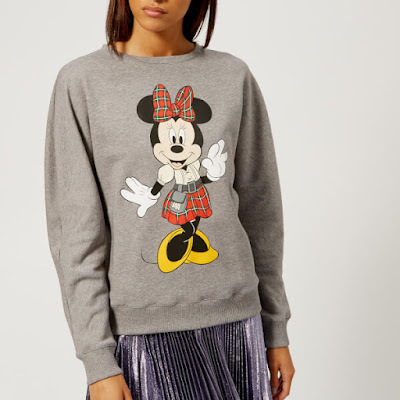 A grey sweatshirt from luxury fashion label, Christopher Kane’s Disney collection. Cut from soft cotton melange with a French terry lining, the sweatshirt is adorned with a colourful print across the chest of Minnie Mouse clad in a tartan kilt and bow, which gives a nod to the designer’s Scottish heritage. Featuring a crewneck, long sleeves and ribbed trims.